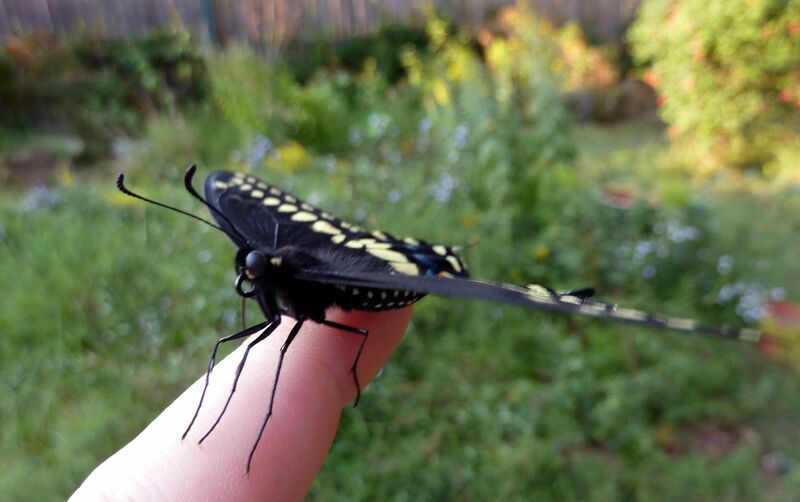 Another Black Swallowtail, Papilio polyxenes, hatched today. This time it's a male. What surprises me though is this was the third one to form a chrysalis but the second one to hatch. I'll give the other one a few more days before jumping to conclusions but there's a chance it will wait until next spring to emerge. I have another 5 caterpillars waiting for make their own chrysalises, and I think that's it for this species this year. The females lay eggs on the Parsley, and the resulting caterpillars are surprisingly conservative eaters. Compared to other cats out there these barely nibble the plant early on. Later instars will consume whole sprigs in a day but you get a surprising amount of caterpillars per parsley plant. I've taken to collecting them once they're an inch long and feeding them Golden Alexander, Zizia aurea, in captivity. Golden Alexander is a host plant but the females will only lay on the tender new growth... once they're done flowering they're pretty much done growing, thus this is only a spring time host plant. The caterpillars are happy to eat it all the same. Also note the meadow garden in the background. I haven't been updating over the summer that much because the orange coneflower, Rudbeckia fulgida, and butterfly weed, Asclepias tuberosa, weren't as showy overall. The Sky Blue Asters, Symphyotrichum laeve, and Symphyotrichum azureus are starting to fill in nicely against the Showy Goldenrod, Solidago speciosa, and Coreopsis tripteris. The two aster species look way to similar to really tell apart, but that's okay as S. laeve tends to bloom a few weeks sooner than S. azureus, creating the illusion of a prolonged bloom.